The European Commission has ordered a recall of a smartwatch for children because of what is calls a “serious” privacy risk. The watch, called Safe-KID-One, is a product of the German electronics manufacturer Enox. The company sells other smartwatch models, as well as televisions and wireless communication devices. The company says the smartwatch can be used by parents to learn where their children are at all times and contact them. It says this can be done with a computer software program, or app. The EC’s warning said the app linked to the Safe-KID-One device can permit non-secure communications with the system’s computer server. The server’s security issues make it possible for people to break into the system and steal private information. As a result, “data such as location history, phone numbers and serial number can be easily retrieved and changed,” it warned. “A malicious user can send commands to any watch - making it call another number of his choosing - can communicate with the child wearing the device, or locate the child through GPS,” the warning said. The founder of Enox, Ole Anton Bieltvedt, spoke to the British Broadcasting Corporation about the EC’s decision. He said the device had met all German government rules last year before being offered to the public. He added that the version of the smartwatch tested by the EC was no longer being sold. Enox plans to appeal the recall decision. Xiaomi M365 Electric Scooter comes with a mobile app that utilizes password-protected Bluetooth communication, allowing its riders to securely interact with their scooters remotely for multiple features like changing password, enabling the anti-theft system, cruise-control, eco mode, updating the scooter's firmware, and viewing other real-time riding statistics. However, researchers find that due to improper validation of password at the scooter’s end, a remote attacker, up to 100 meters away, could send unauthenticated commands over Bluetooth to a targeted vehicle without requiring the user-defined password. "During our research, we determined the password is not being used properly as part of the authentication process with the scooter and that all commands can be executed without the password," Rani Idan, researcher with Zimperium zLabs, explains in a report shared with The Hacker News. "The password is only validated on the application side, but the scooter itself doesn’t keep track of the authentication state." To demonstrate one of the attack scenarios, as shown in the video, researchers developed a specialized proof-of-concept (PoC) app that scans for nearby Xiaomi M365 scooters and locks them by using the anti-theft feature of the scooter, without authentication or victim's knowledge. "The app sends a crafted payload using the correct byte sequence to issue a command that will lock any nearby scooter in the distance of up to 100 meters away," the researchers say. The researchers also developed a PoC app for installing malicious firmware capable of accelerating the scooter, but due to the safety concerns of the M365 Electric scooter riders, they will not publish its PoC. Zimperium already reported their findings to Xiaomi two weeks ago. The Chinese company acknowledged them, saying that its team was aware of the issue and is working on a fix to address it. Since there is no mitigation that users can deploy at their end, M365 Electric scooter riders are recommended to implement the patches as soon as they become available. Until then, they can not do anything except avoid riding their scooters for a while. A significant bug has been discovered in FaceTime and is currently spreading virally over social media. The bug lets you call anyone with FaceTime, and immediately hear the audio coming from their phone — before the person on the other end has accepted or rejected the incoming call. Apple says the issue will be addressed in a software update “later this week”. 9to5Mac has reproduced the FaceTime bug with an iPhone X calling an iPhone XR, but it is believed to affect any pair of iOS devices running iOS 12.1 or later. Whilst the call is dialling, swipe up from the bottom of the screen and tap Add Person. It will look like in the UI like the other person has joined the group chat, but on their actual device it will still be ringing on the Lock screen. The damage potential here is real. You can listen in to soundbites of any iPhone user’s ongoing conversation without them ever knowing that you could hear them. Until Apple fixes the bug, it’s not clear how to defend yourself against this attack either aside from disabling FaceTime altogether. As it stands, if your phone is ringing with an incoming FaceTime request, the person on the other end could be listening in. Apple has said the issue will be fixed in a software update later in the week. Until then, if you are concerned, you should disable FaceTime in iOS Settings. Remember the feeling of a brand new Mac? A Mac without rainbow wheels. A Mac that didn’t cause headaches or frustration. Everything was just perfect! However, with all apps, documents, photos, and a full iTunes library, your Mac starts to act as if it’s hiking 20 miles uphill in the snow. 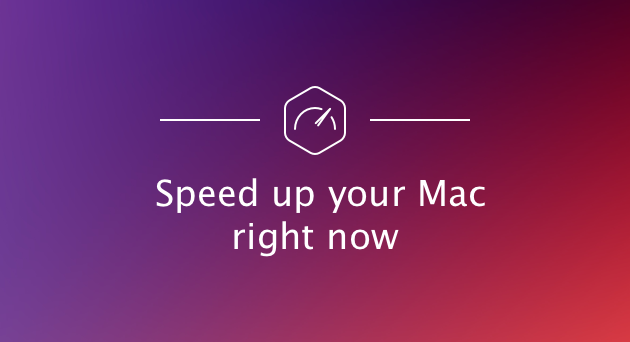 We’ll show you 10 ways to speed up your Mac. These simple steps won't take much time, but will greatly help to improve your Mac's performance. If you do these activities regularly, you won't have to worry about the need to speed up your Mac again. Some apps are more power hungry than others and can slow your Mac to a crawl. To see which apps are eating up your system resources, use Activity Monitor. You can open it from the Utilities folder of your Applications folder, or use Spotlight to find it. Activity Monitor details five different resources: CPU, Memory, Energy, Disk, and Network usage. If your Mac is running slowly, pay special attention to the CPU section. It shows how processes affect CPU (processor) activity. Click a column name, such as % CPU, to list all programs by the amount of CPU they’re using. It goes without saying that a clean startup helps speed up slow Mac. When your Mac launches faster, it takes less time to do anything. No waiting for Safari, Chrome or Firefox to launch — they open instantly. How do you get such speed? Well, when your Mac boots up, it runs a lot of unnecessary apps. But it’s quite easy to take control of it. 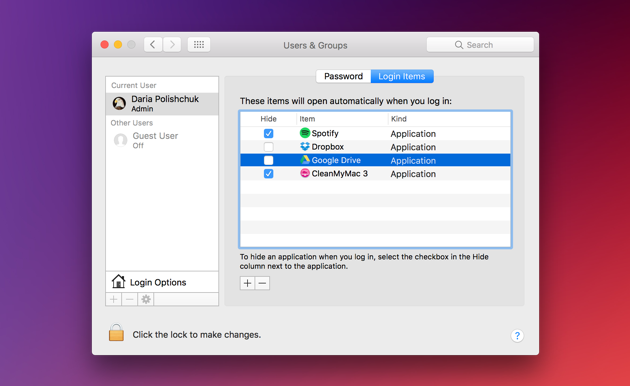 Go to your System Preferences > Users & Groups and then click on your username. Now click on Login Items and select a program you don’t immediately need when your Mac starts up, and click the “-” button below. A great tip to help you when you wonder how to speed up your Mac is to turn off visual effects. Sure, they look pretty, but who cares if your Mac is running slowly? Turning off some of the features can greatly speed up iMac or MacBook. Note that beginning from OS X EI Capitan, there is no need to repair disk permissions. System file permissions are automatically protected, so it’s no longer necessary to verify or repair permissions with Disk Utility. But if your Mac runs OS X Yosemite or earlier, repairing disk permissions can help speed up old Mac. Another proven way to speed up MacBook Pro, MacBook Air or iMac is to uninstall the application you don’t need anymore. So how to remove unwanted apps on your Mac? You may be surprised to find out that simply dragging them to a Trash bin is not enough. It leaves gigabytes of junk behind. Dragging documents and movies to Trash works fine but apps should be uninstalled completely. Typically, Macs take care of themselves. Having the latest software from Apple makes speeding up your Mac simple. To check your version of the operating system, click the Apple icon in the top left corner of your screen and then About This Mac. Make sure you have the latest macOS/OS X installed (or the latest you can install since not all Macs upgrade to macOS Mojave). If you need to reboot your Mac but want to reopen apps automatically after rebooting, check the Reopen windows when logging back in box in the pop-up menu. Earlier this month, the FTP warned about a growing scam: people pretend to be from the Social Security Administration (SSA) and try to get your Social Security number or your money. That scam is now growing exponentially. To compare: in 2017, we heard from 3,200 people about SSA imposter scams, and those people reported losing nearly $210,000. So far THIS year: more than 35,000 people have reported the scam, and they tell us they’ve lost $10 million.